Since it’s almost Valentine’s Day, and you might be looking for the perfect floral gift to give your loved one, we thought we’d write about some pretty flowers that look like hearts. If you’re part of a couple, you may want to consider sending some of these flowers to show your love. If you’re not, it’s okay. You can send them to a son, daughter, mother, father, sister, brother, or other family member. Or, you can buy a little bunch of them and give yourself a heart-felt gift for the holiday. Flowering cyclamen is a small plant that can bring big bunches of love into a home for Valentine’s Day. The plant features heart-shaped foliage that’s beautif ully colored, and as a bonus it has pretty pink flower petals that sweep upward and seem to lift the spirit. Flowering cyclamen usually blooms in late winter or early spring, so it’s perfect to give for Valentine’s Day! **Note – This flower is mildly toxic, so you’ll want to keep it away from small children and animals. Anthurium offers a double-dose of love. It has heart-shaped leaves and flowers that are formed a bit like little hearts. Anthurium blooms in a variety of colors and sizes, so you can pick from pink, red, and other hues for this plant on Valentine’s Day. Many nurseries carry Anthurium, so it should be pretty easy to find itin your area. If you can’t locate Anthurium, you can always order the plant online for expedited holiday delivery. **Note – This flower is also mildly toxic, so you’ll want to keep it away from small children and animals. 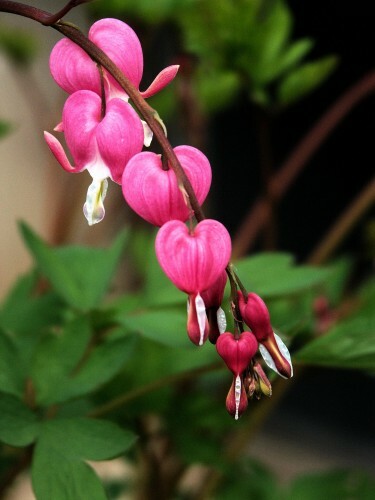 Bleeding Hearts might be the first flowers that come to mind for many when thinking about heart-shaped blossoms. These flowers look exactly like a traditional heart, but with a twist. They appear as though they’re bleeding because of the little tail that hangs down from the bottom of the bloom. This could signify your deep commitment to your lover and the fact that you’ll be there through it all. Do you have any favorite flowers that are shaped like hearts? Have you ever given heart-shaped flowers for Valentine’s Day? If so, we’d love to hear your story in the comments below. Since it’s almost Valentine’s Day, and you might be looking for the perfect floral gift to give your loved one, we thought we’d write about some pretty flowers that look like hearts.If you’re part of a couple, you may want to consider sending some of these flowers to show your love. If you’re not, it’s okay. You can send them to a son, daughter, mother, father, sister, brother, or other family member. Or, you can buy a little bunch of them and give yourself a heart-felt gift for the holiday.